Recently I spoke to a MomsNext group (an extension of MOPS) and for a spontaneous giveaway, I asked the ladies if they would count how many rewards cards they currently had in their wallets. The one with the most, who won a little prize from me, had more than 50. Fifty reward cards she was carrying around! I may not have that many, but I do have several. But with age comes wisdom, and with wisdom comes scrutiny. If I don’t frequent a business more than a few times a year, I won’t sign up for a loyalty card. Less frequent than that, let’s face it – I’m just not that into you. Red Robin on the other hand, is one of very few restaurants I’m loyal with. In particular, their Bruschetta Chicken Sandwich is the menu item I’m most loyal in ordering (totally a three-napkin sandwich). And bring your elastic-waist pants, because … Bottomless Steak Fries. Red Robin Gourmet Burgers calls theirs a Royalty program, where you can earn surprises throughout the year, such as a free birthday burger, and every 10th item is free. 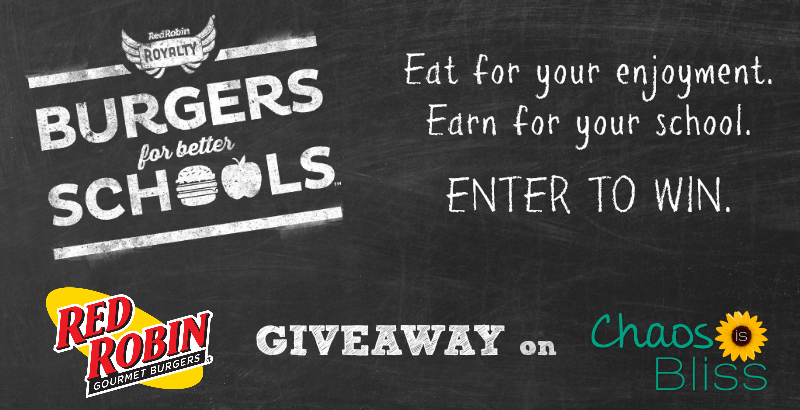 To give back to local communities, Red Robin has launched the Burgers for Better Schools program, which is an extension of the Red Robin Royalty program. 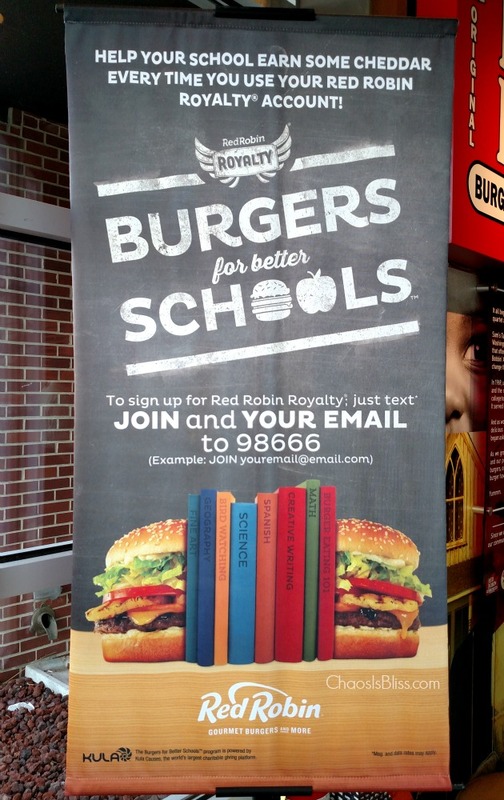 When you join Burgers for Better Schools, Red Robin will donate 1% of your check to the school of your choice. It’s that easy! First you’ll want to join Royalty Rewards (add your kids onto your account, and they’ll get their own birthday treats! ), then you’ll be able to select your school. Then present your card (or mention to your server that you’re a member) and 1% of your check will be donated to your school! Spread the word by sharing this post with your school’s PTO group, and use this toolkit to print flyers to distribute to your school and access other sharable images. You can even track your school’s progress and see just how much will be donated to your school. Red Robin has provided me with a huge $75 Red Robin Gourmet Burgers gift card to give away to one lucky Chaos Is Bliss reader! Check that there’s a Red Robin near you, and enter with the Rafflecopter widget below. 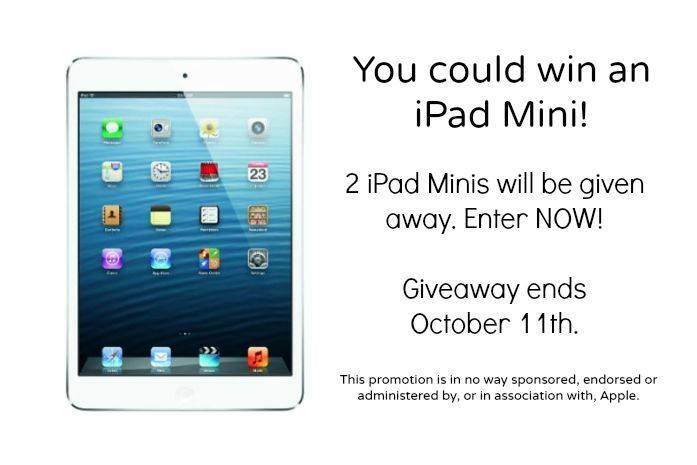 The contest is open NOW, and ends at 11:59pm ET Wednesday, 10/7/15. Good luck! This information and gift cards have been provided by Red Robin, but all words and opinions are 100% my own. Have you entered this other giveaway yet? My favorite Red Robin item is the Bacon Cheeseburger with unlimited fries. It is so delicious! I am madly in love with their whiskey river BBQ burger. I like the Royal Red Robin burger. I love the Banzai burger. I like the Bleu Ribbon burger. I like Red Robin Gourmet Cheeseburger. I like the onion rings and chophouse burger. We love the tower of onion rings and the Banzai burger. My favorite item is the Original Red Robin Burger and Steak Fries. Bleu Ribbon burger is my fave! I love the a-vo cobb-o salad. I love their gluten free burgers – pretty much all of them are good. Anything with cheese is good! I like their Guacamole Bacon Burger. I love to get their Simply Grilled Chicken. I have to say my favorite Is the fish and chips always good! My husband love the patty melt! I love the tower of onion rings! My favorite is the bacon cheeseburger. This is so awesome! I still haven’t ever been to Red Robin, but when I do visit I plan on trying the Whisky River BBQ burger! It looks and sounds delicious! The Tower of Onion Rings is my favorite thing at Red Robin. My burger of choice is the Bleu Ribbon. My favorite is the Whiskey River BBQ Sandwich. I love the grilled turkey burger. I Like The BLEU RIBBON BURGER! I like the Burnin’ Love Burger and the onions rings are awesome too! I love to order the crispy chicken sandwich at Red Robin. I love their Bacon Cheeseburger with Monterey Jack Cheese with Jalapenos. Absolutely the fries and their delicious seasoning! My favorite Red Robin menu item is the Nantucket Seafood Platter. I like the Banzai Burger. I love Red Robin’s Bacon Cheeseburger! I like their whiskey river bbq burger- it is just so good! I really like the guacamole bacon burger. I like their Whiskey River BBQ Burger. I like teh Whiskey river BBQ Burger! I love the Guacamole Bacon burger and their fries. I love their shroom burger and the french fries! The bacon cheeseburger is my favorite menu item!! I like the All American Patty Melt! i like the bacon cheeseburger with extra pickles. The Bleu Ribbon burger is my favorite. Whiskey River burger with a veggie patty is my fave Red Robin item. I think I entered my instagram username as thatnattygall but it’s actually thatnattygal with just one l.
I love the Ocktoberfest burger and the bottomless fries. whiskey river BBQ burger- IT’S TOO GOOD FOR WORDS. I love the tower of onion rings – especially when it comes out with the dipping sauces. I really like the grilled turkey burger and french fries.